There are a lot of lace and open work designs using Kidsilk Haze and Fine Lace. I will post more photos tomorrow. The lunch with my brother and sister in law was OK! No disasters in the kitchen! Nothing much happening today. John has taken one of his fly fishing reels to pieces and now he cannot get it back together again! There are hundreds of screws and little pieces. I am steering well clear. Another mouse caught in the loft. I wonder if we will beat our last year’s total? Must go and get ready for the post person now! I am still here! Just been so busy and feeling tired. My brother and his wife are coming for lunch today and so I have to have a massive dusting and vacuuming session! I am cooking monkfish wrapped with parma ham with crushed roast new potatoes and a root vegetable medley with a gratin top. I have made a pear and ginger custard flan for pudding. The mice are back in the loft – we have caught four so far. I can hear them scampering around in the night. Maybe Jackson could spend a night up there? My shipment of Angora Haze should come tomorrow or Tuesday – I have all colours coming. I have some photos from the new Rowan Magazine which I will post tomorrow. Got to get on – so much to do! Sorry, sorry, sorry! I have been very busy packing and posting. Plus we have had dreadful weather. The wind broke all the glass in the greenhouse during the night and John is outside fitting new as I write this. Big news for those of you who have not heard……Rowan have discontinued Angora Haze. There has been a lot of bad publicity in the UK regarding the treatment of the rabbits used to produce angora yarn and so Rowan have decided not to continue with it. They are working on a substitute. I have ordered more before stocks run out as it is produced and any damage has already been done. Another piece of news is that the new Rowan yarns and new shades are going to be here along with the magazine and books on January 14th,,,,,previously the yarns did not come until February 1st. We are going out for a meal tonight – only to the pub. Tomorrow we shall be on our own. Boxing day we are going on our house hunting trip and on Sunday my brother and his wife are coming to lunch. I shall be posting the Christmas contest tomorrow – so come back then! Happy Christmas and many thanks for your support! Sorry to have deserted you all. It has been a very busy week both yarn wise and dentist and hospital wise. I saw the consultant on Tuesday – it was a waste of time really as he said there is nothing that can be done for my right thumb. I had an operation on it about 10 years ago because it was arthritic. They removed some bone and built it up with tendons from my wrist. I t has now collapsed. He said he could try to fix it but it might mean that my thumb would be too bent for me to hold a pen! The left thumb is now very arthritic and needs the same operation as the right one had but he stressed the risk of it collapsing. So I do not know what to do! Last night we went to Smiths for dinner. I had Thai chicken skewers with crispy noodles followed by jumbo prawns in a chilli and garlic sauce and John had a whole dressed crab followed by a fillet steak. It was nice but rather rich…..I am just as happy with a piece of toast and peanut butter! My brother and sister in law are coming to lunch on the 29th. I think I shall do monk fish wrapped in parma ham with crushed new potatoes and asparagus spears. That way I can cook it all when they have arrived as they are always late in arriving! And I shall make a chocolate roulade and fill it with chestnut puree and cream. We have a contest winner….. Gemma knew that the answer is Rowan Felted Tweed Aran. Tomorrow I will start a new contest which will only have one question that will decide the winner…no long winded things! Now I must go and get ready for the postman. Back tomorrow! Horrid wet day here! I am cooking Chicken Rendang for lunch with rice and Bombay potatoes. Tomorrow John goes to the dentist and on Tuesday I go to see the hand surgeon. Wednesday we go to Smith’s for dinner. I now have all colours of Rowan Angora Haze back in stock and also all shades of Felted Tweed. I am thinking of buying a wool winder and offering to wind skeins for customers – anyone have any thoughts on this? Sorry, not much news……maybe more tomorrow! Nancy, Gemma, Joan P and Jenny C all answered the last question correctly, The word was Costa and the odd man out is Costa Rica as it is a country and all the others are regions. Next question : Where would you find an Irish county with a curry and a wood? Answers to jannette@easynet.co.uk with Findings as the subject by midnight on Saturday please. I am having my website re-vamped today – a change of colour scheme and the layout altered slightly. Not major changes – just a slight face lift! 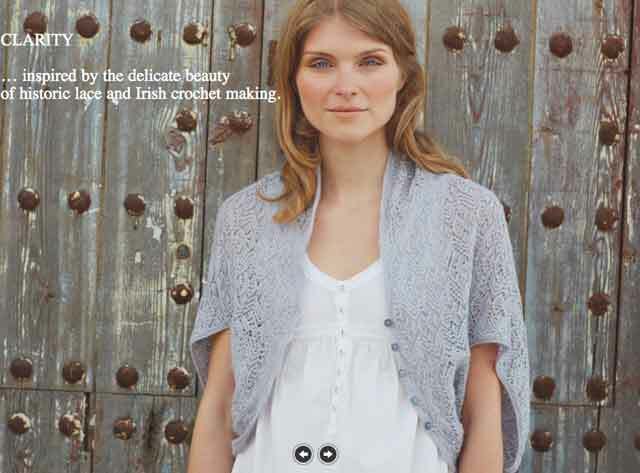 The Rowan Fine Art Aran book will be here any day now. Also an Artyarns order. And some new knitting bags…all go! It is foggy here again and very damp. John decided to sweep the chimney today of all days – we had to have the doors open – I was frozen. Going to peel prawns for dinner now! John is at the dentist and so I thought I would write this whilst I have a moment! Bianca, Brava, Calida, Dorada, Rica, Vasca. Answers to jannette@easynet.co.uk with odd one out as subject by midnight Wednesday please. West Yorkshire Spinners Blue Faced Leicester yarn will be here tomorrow and also some socks from them. The Filatura order should come too. Cold and foggy here today. I have been sorting out all my shawl pins and found several that are not in the shop, no wonder I am not selling them. It is still 3 for the price of 2 for all Jannette’s Rare Yarns shawl pin sets. Now I had better get on – no parcels packed yet!